LAS VEGAS (PAI) — Coca-Cola’s attempt to get rid of the Teamsters and a union contract in Las Vegas fizzled out like so much bad soda. On Nov. 8, a surreptitious campaign by Coke management and its minions culminated in an 85-54 National Labor Relations Board-ballot box spanking of the company. 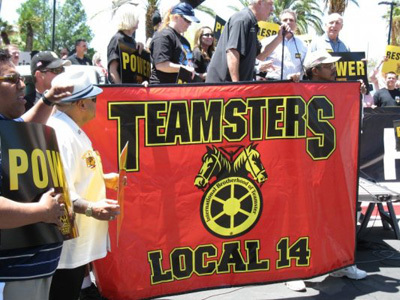 The defeat of Coke’s attempt at decertifying Teamsters Local 14 came on the heels of Coke trying to circumvent longtime contract language on seniority bidding of overtime work. The battle began when 14 agents slapped down Coke’s direct bid to negate the contract and established past practices. A decertification notice “surprisingly” appeared on the company fax machine. Contractual relations between Local 14 and Coke in Las Vegas have decades of history behind it. Local 14 President Al Ghilarducci, business agent at Coke for over six years until agent Jaime Olvera was assigned to the company, asked the on-site general manager what his problem was. Local 14 Secretary-Treasurer Larry Griffith said the decertification effort is what Coke fosters across the country against Teamster units. “They opened up the company checkbook and brought in the hired-guns, a union-busting company from back east. They followed that by shipping in Coke management people to work over our Teamsters in captive meetings. It turns out they didn’t have any bullets to b—s— our members,” he said. The 2-month campaign was on. At the end, on voting day, many Teamsters found themselves forced to work overtime away from balloting held at the company. In the meantime, the union-busters and supervisors hammered the Teamsters in group and individual settings. The company made repeated pleas of “give us a chance for one year to show what Coke can do for you (without the union).” But Griffith and Ghilarducci advised members to ask the company reps to put their pie-in-the-sky promises and possibilities in writing. They asked. And the company wouldn’t. Leading the members’ responses, questions and discussions at the company-controlled meetings were primarily stalwart Teamsters Homar Parra and Marty Craw. “They were definitely our inside leaders and kept the group together and from being ramrodded by the company,” Griffith said. Meanwhile, Local 14 conducted scheduled meetings with its members at the union hall on Oct 6, 11, 20 and Nov. 3, and informal get-togethers on the street. Teamsters organizer Jason Gateley participated at each meeting. But, daily, business agents Olvera and Ghilarducci covered all shifts and departments on site. “I cannot reiterate enough how this election was almost solely won by the members at Coke. It was their singular resolve, toughness and respect for their union. Single-issue professionals who devote their lives to busting the union worked our members over hard. And they didn’t crack,” Griffith said. 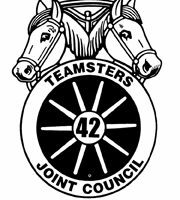 While union-busters spewed their venom, Teamsters Joint Council 42 President Randy Cammack contacted Western Conference of Teamsters pension manager Walt Pentz for pension input. A pension rep from Northwest Administrators landed in Las Vegas armed with a personal Teamster pension workup-in writing unlike Coke’s verbal act-on every Local 14 member working at the company. At a meeting the rep distributed the paperwork and explained what pension credits they had accrued as Teamsters, noting that 47 percent of the shorter-term workforce were not fully vested and coverage would be lost if the company went non-union. As election day neared, Cammack dispatched the council’s show truck to the company gates. For two days Teamsters from far and wide picketed and rallied with the Coke members up to voting time. “The solidarity and brotherhood during this ordeal by the members inside the plant was intense, and the support from Teamsters across the country was phenomenal,” Griffith said. Teamster reps with Coke contracts were on hand from locals in Covina, Los Angeles, and South El Monte in California, plus Spokane and Seattle, Wash., and Reno, Nev. Dennis Hart from the union’s Brewery and Soft Drink division, and Steve Jones from North Carolina also came. Dozens of Local 14 members and shop stewards were on the line. “What a victory for Teamsters. What a victory for good Teamster jobs,” Griffith said.